Filming is underway in Chicago for the young adult novel adaptation of Divergent, starring The Descendants star Shailene Woodley. Looking to land The Hunger Games audience, the story is set in a dystopian future where society is divided up into five factions and Breatrice "Tris" Prior (Woodley) learns that she doesn't belong in any of them. These people are called Divergents, but the plot thickens when she learns of a plan to destroy all the outcasts. 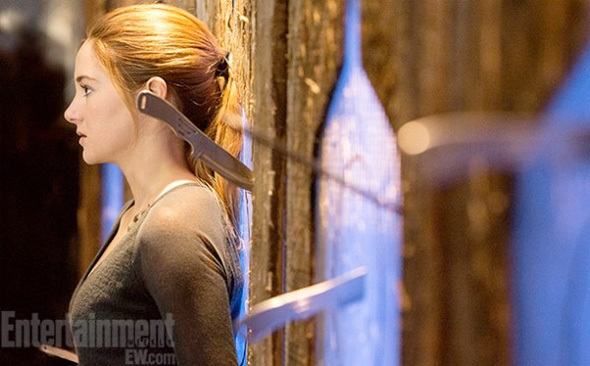 Now we have a first look at the film where Tris is engaged in some sort of initiation where she has knives thrown at her head. People at the carnival call that Tuesday. Divergent is a thrilling adventure set in a dystopian future Chicago where people are divided into distinct factions based on their personalities. Tris Prior (Shailene Woodley) is warned she is Divergent and will never fit into any one group, and when she discovers a conspiracy to destroy all Divergents, she must find out what makes being Divergent so dangerous before it’s too late. Kate Winslet, Ray Stevenson, Mekhi Phifer, Maggie Q, Jai Courtney, Miles Teller, Zoë Kravitz and more star in the film from director Neil Burger (Limitless), written by Evan Daugherty (Snow White and the Huntsman) and Vanessa Taylor ("Game of Thrones"), based on Veronica Roth's book of the same name and hitting theaters on March 21st, 2014.
wouldnt that make the divergents the sixt faction?